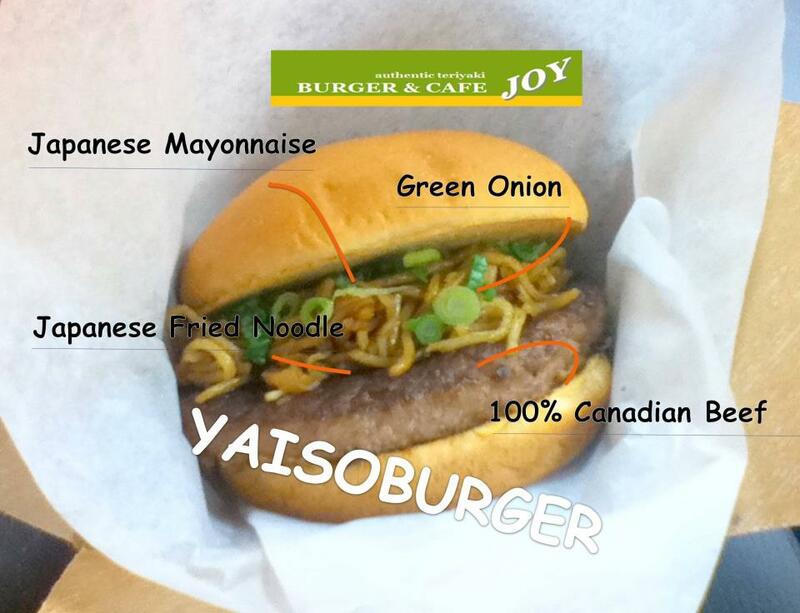 Burger and Cafe JOY blog: The latest addition - Yakisoburger! The latest addition - Yakisoburger! Which are you enjoying spring-like or still-winter days? Warmer weather is more than welcome though, no thanks for getting stuck at bottom of steepy slushy road. Once again, we introduce one of our popular burgers at this time. It is our new face, Yakisoburger. The name is combined the two words, Yakisoba and burger. This rookie came to be real from some of our regular customers idea. They like our Teriyaki burgers and yakisoba sand(wiches) and suggested us to make Yakisoba burgers. What a unique and novelty idea! Thank you, James, Richmond, Gabor and Shay from Japanese Club at TRU! Everybody likes Yakisoburger now! Yakisoba is Japanese style fried noodle like chow mein. Enjoy the harmony with noodles and pate. The yakisoba sauce which is very similar to Pork katsu sauce and a bit of Japanese mayo work just great on it.